Preheat the oven to 300 degrees. In a large shallow dish, whisk together flour, 1 tablespoon salt, and 1 ½ teaspoons pepper. Dredge the shanks in the mixture. In a large heavy-bottomed pot or Dutch oven, melt 3 tablespoons butter with 3 tablespoons olive oil over medium-high heat. Brown the shanks on all sides. Remove from the pot and set aside. Wipe out pot, and lower heat to medium-low. Add remaining tablespoon butter and oil. Add the carrots, onion, and celery to pan. Saute until mostly tender, 8 to 10 minutes. Add the tomatoes, stock, and wine; simmer for 8 minutes, scraping the bottom of the pan. Return the meat to the pot; add garlic, bay leaf, parsley, and basil. Cover and bake for 3 hours, or until meat is tender. Remove the veal and set on a warm platter. Cover with foil to keep warm. Strain the cooking liquid through a fine mesh sieve and return liquid to pot. Reduce to 2 cups. Remove herbs from the vegetables and discard. Puree vegetables in a blender and return to pot (alternatively vegetables can be returned to the pot and pureed with an immersion blender). To make the gremolata, mix together lemon and orange zest. 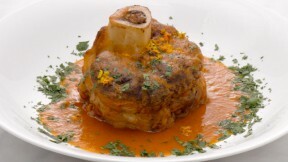 To serve, place 1 shank on a warm plate and spoon some sauce over the meat. Garnish with gremolata.